TRANSFORM your motorcycle audio experience! BT-444/454: Titan Two-Channel Compact Class-D Amplifier. Two channel amp. At roughly 1.5 X 3.25 X 4.25 inches, the Titan 75 watt RMS stereo amplifier is the smallest, most powerful mobile amp in its class. The BT-444A Titan amp will TRANSFORM your motorcycle audio experience with more teeth-clenching, high-quality sound than you'll ever need! Plug-n-play installation in ten minutes using factory connectors. The simple single piece water resistant design has no barrier terminals to connect or corrode. No wires to pull to the battery. No satellite units to mount. The unit protects your charging system with StatorGuard technology. A very reliable unit with factory lifetime warranty. High performance, Hi-Energy coaxial speakers also available. Designed and manufactured in the USA. BT-480: Titan UcD Expandible Class-D Amplifier System. The smallest, clearest, most powerful mobile amplifier system available. 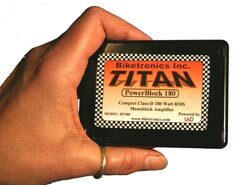 At 180 watts per channel of super clear audio, the new Titan Power- Block180’s get the job done. The system is expandable so you can start with two channels and add additional channels as needed. The Titan PowerBlocks easily accept additional speakers on each channel (supports one-ohm loads!) PowerBlock180’s use patented Class-D technology called UcD. 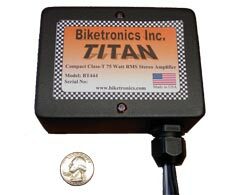 Titan protects your bikes charging system with StatorGuard™ technology and features Plug-N-Play simplicity using factory connectors. 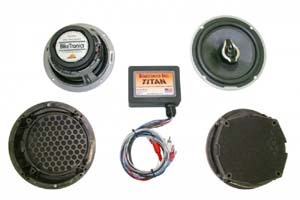 Titan also comes with our OEM lifetime warranty and is designed and integrated in the USA. CAUTION: The Titan Amplifier is very powerful and care must be taken to protect hearing as well as conform to any noise ordinance your area may be subject to. Using Titan at extreme volume levels may cause hearing loss! Please exercise good judgment. BT-443, BT-446: Hertz, Standard Performance, 4 inch, 4 ohm, pre-'96 model year front coaxial speakers. (Frnt or rear on pre-'96 model year bikes. May be used on '96 and '97 model year rear location but customer must confirm 4 inch size.) Top rated replacement speaker line. Four ohm nominal impedance. Copper voice coil, wound on aluminium form. Tweeter connected inside voice coil minimizes cone distortion. Available in 5-1/4" (BT443) and 4" (BT446) sizes.. Peak Power Rating: BT443-100W, BT446-80W. BT-445, BT-448: Hertz, High Performance, 4 inch, 4 ohm, pre-'96 model year front coaxial speakers. Titan-Hertz High-Energy speakers utilize enormous high-strength magnets. Four ohm nominal impedance. Pleated-surround provides huge cone movement enhancing low frequency performance - exactly what is needed on a bike. Heavy copper voice coil, wound on kapton form provides optimal thermal and mechanical capacity. Tweeter connected inside voice coil minimizes cone distortion. Available in 5-1/4" (BT445) and 4" (BT448) sizes. Peak Power Rating: BT445-140W, BT448-100W.